Today, we'll address a major gardening dilemma. What do you do when you run out of space in the garden? Don't panic ~ just pot up some containers, of course! Every year, The Big Little Garden experiences some sort of "expansion" in order to accommodate my obsession with plants. 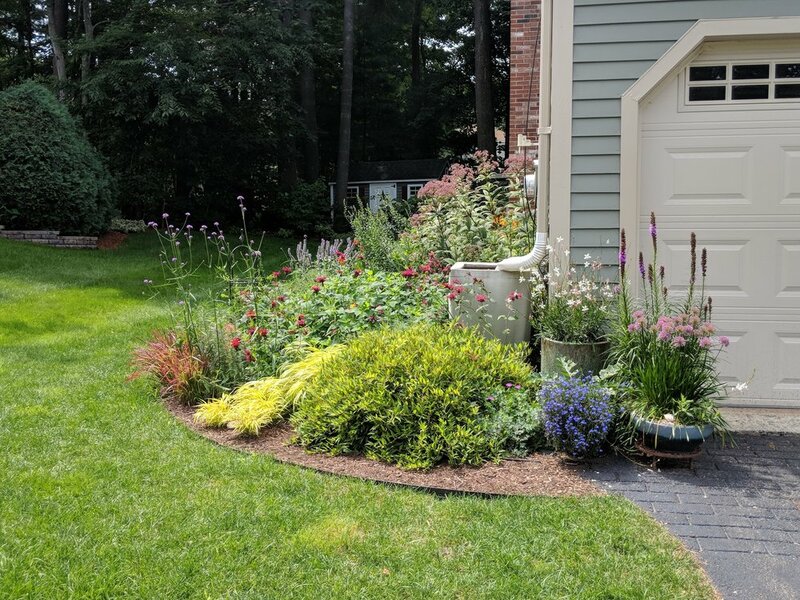 But even after this year's belt-loosening of the "garage bed" and the addition of the "fence bed", there is still a call for plants in containers. Container gardening really helps to extend the life of the garden, getting an earlier start, and providing color until frost. 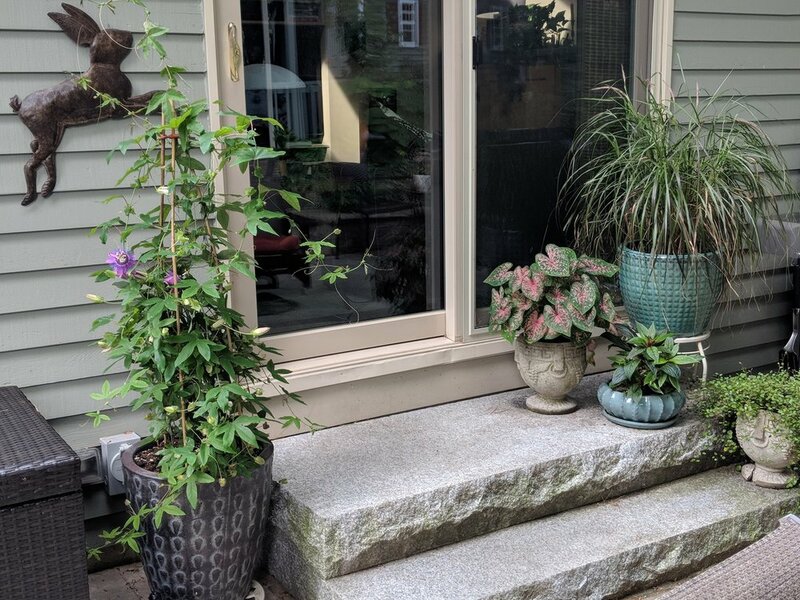 My approach to using containers in the garden is a bit different than the typical application of planting annuals in a "thriller, filler & spiller" combination (although I love those, too!) I love to pot up bulbs and perennials that can be rotated in and out of the garden and outdoor living spaces as my mood and the surrounding gardens change. Now a few weeks later on July 31st, the astilbe is done blooming and pots become more colorful. The red Crocosmia is strategically located for maximum viewing of the hummingbirds who stop in frequently for a sip of nectar. Can you see her coming in for a landing, just to the right of the red spray of Crocosmia flowers below? I have become enamored with pots that have a verdigris color theme as they can be grouped to compliment one another and do not clash with the plant and bloom color. Blue lobelia, an annual planted back in early May. Same pot has one Acanthus perennial which is stubbornly refusing to bloom this year, but the foliage is gorgeous. In addition to providing accents of color in your outdoor living spaces, containers offer an easy way to "fill holes" in the garden. 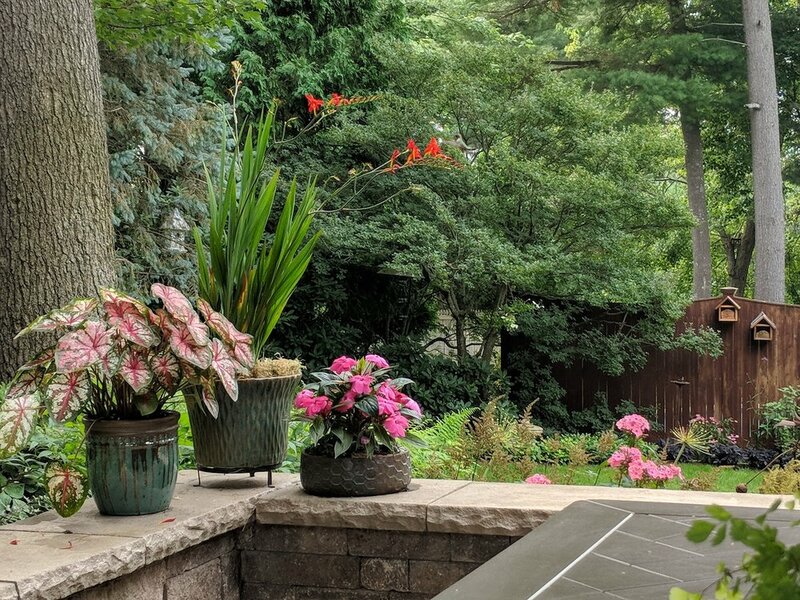 In the following view, the red Crocosmia and yellow Achillea (yarrow) are rotated in after the in-ground planted Baptisia, Evening Primrose, Amsonia and Trollius are done blooming for the season. The Crocosmia pot is obscured by the foliage of the Goldenrod in front and appears as if it's planted in the ground. I actually plan for the loss of color and strategically install flat stepping stones among the perennials. When it's time for a color infusion, the containers can be easily placed within the garden without damaging or suffocating the surrounding perennials. This approach allows me to experiment with different colors and textures without having to commit to installing the plants directly in the soil. 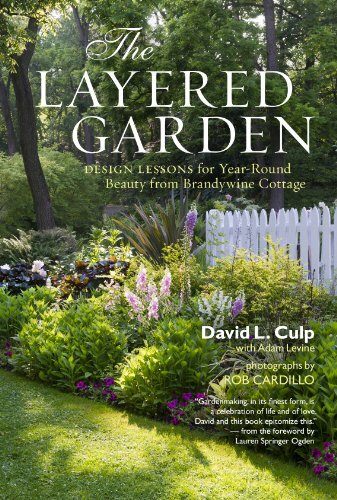 For more ideas on using containers in your garden, I can highly recommend The Layered Garden, one of my favorite books by one of my favorite gardeners and authors, David Culp. The Layered Garden has been one of the most influential gardening books in my library. It provides amazing tips on how to plant for 4 season interest and long succession blooming. David's "color pots" play a significant role in extending the season in his Brandywine Cottage garden. David's fun, relaxed "judgement-free" approach to gardening is so refreshing. In his world, there really aren't gardening "rules". Just garden to please yourself and don't be afraid to push the limits of plant combinations! Click on the link to the left to view it on Amazon! I hope this post has inspired you to experiment with colorful containers in your garden. If you have any questions or need help with your garden, please contact me for a free, no-obligation phone consultation! Also feel free to email me photos of your container gardens! I would love to see them.